Acid rain is a broad term referring to a mixture of wet and dry deposition (deposited material) from the atmosphere containing higher than normal amounts of nitric and sulfuric acids. 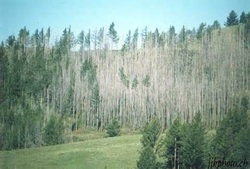 The precursors, or chemical forerunners, of acid rain formation result from both natural sources, such as volcanoes and decaying vegetation, and man-made sources, primarily emissions of sulfur dioxide (SO2) and nitrogen oxides (NOx) resulting from fossil fuel combustion. When sulfur dioxide and nitrogen oxide emitted by cars and factories combine with moisture in the air, acid rain is formed. Acid rain, which often falls far from the source of pollution, kills trees, makes lakes unfit for fish, and even dissolves the stone in buildings and monuments. Rocky areas with thin topsoil are particularly apt to be damaged by acid rain. In this unit we will look at the formation of acid rain, its effects on the ecosystem and strategies to reduce acid rain formation. ​This unit is a minimum of 2.5 hours. Acid deposition can impact living systems and the built environment. The pollution management of acid deposition often involves cross-border issues. 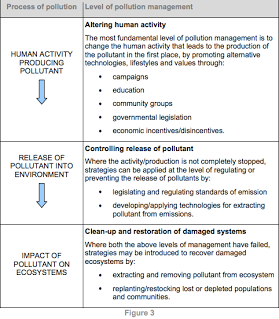 To what extent have the solutions emerging form this topic been directed at preventing environmental impacts, limiting the extent of the environmental impacts, or restoring systems in which environmental impacts have already occurred? 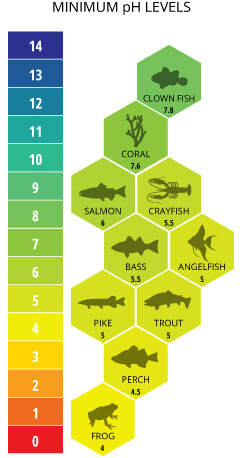 To what extent is acidification yesterdays problem? Why has acidification declined in certain regions? In what ways is acidification likely to change over the next decades? 6.4.U1 The combustion of fossil fuels produces sulfur dioxide and oxides of nitrogen as primary pollutants. 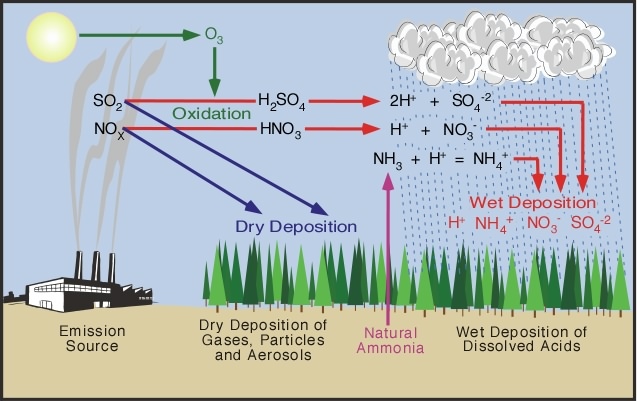 These gases may be converted into secondary pollutants of dry deposition (such as ash and dry particles) or wet deposition (such as rain and snow). Refer to the conversion of sulfur dioxide and oxides of nitrogen (NOx) into the sulfates and nitrates of dry deposition and the sulfuric and nitric acids of wet deposition. Knowledge of chemical equations is not required. 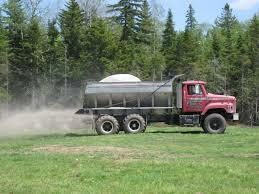 indirect nutrient effect—for example, leaching of plant nutrients. Acid rain directly affects the chemical and pH balances in ground water. The excess aluminum created by acid rain makes aquatic environments such as the sea, lakes, and streams, toxic. The animals that can withstand the imbalance of the water's natural minerals might survive, but quickly lose their food source as the weaker creatures die off. Acid rain leaches calcium out of the soil when it is absorbed by the earth. This directly affects the mineral levels of the soil and the creatures, such as snails, that rely on that calcium for shell growth. Consequently, snails die off and birds, which eat them for calcium, lay eggs with shells that are weak and brittle and therefore fail to hatch. Acid rain directly impacts forest ecosystems and their inhabitants. Acid rain damages leaves as it falls. Acid rain runoff from the trees and forest floors infiltrates the forest's water supplies; runoff that doesn't enter the water supply is absorbed by the soil. Acid rain is dangerous to humans. The same sulphate and nitrate particles that directly affect the soil and water pH balances can cause serious damage to the respiratory system if inhaled deeply. A damaged respiratory system means decreased oxygen in the blood supply, which eventually damages the heart. 6.4.U3 The impacts of acid deposition may be limited to areas downwind of major industrial regions but these areas may not be in the same country as the source of emissions. regulating and monitoring the release of pollutants—for example, through the use of scrubbers or catalytic converters that may remove sulfur dioxide and oxides of nitrogen from coal-burning powerplants and cars. ​6.4.U5 Clean-up and restoration measures may include spreading ground limestone in acidified lakes or recolonization of damaged systems—but the scope of these measures is limited. 6.4.A1 Evaluate pollution management strategies for acid deposition. 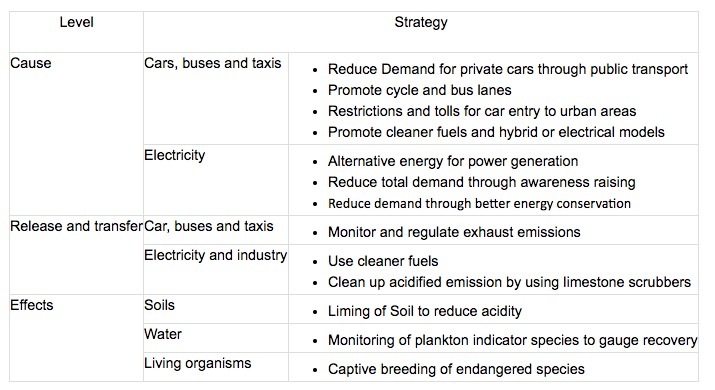 Measures to reduce fossil fuel combustion should be considered, for example, reducing demand for electricity and private cars and switching to renewable energy. Refer to clean-up measures at “end of pipe” locations (points of emission). Consider the role of international agreements in effecting change. 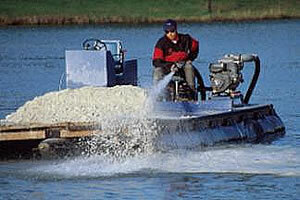 The cost-effectiveness of spreading ground limestone in Swedish lakes in the early 1980s provides a good case study. ​​​​​​​Correct use of terminology is a key skill in ESS. It is essential to use key terms correctly when communicating your understanding, particularly in assessments. Use the quizlet flashcards or other tools such as learn, scatter, space race, speller and test to help you master the vocabulary. The polluting country and the polluted country are often not the same: acid deposition affects regions far from its source. Therefore, solving this issue requires international cooperation. To what extent does the recognition of the ethical responsibility of knowledge influence the further production or acquisition of knowledge? Most cases of non‑point source pollution exemplify well the intractable ethical problem of the “tragedy of the commons”. That is to say, an individual polluting a common resource suffers little themselves from their own pollution and yet may benefit considerably in other ways. Therefore, those that do not pollute are doubly penalized—they suffer the pollution, and yet gain no benefit from polluting the resource themselves. There is thus a net advantage for any individual who does pollute. Ultimately, as many individuals adopt the most advantageous attitude, this leads to a great deal of suffering for all. It is exactly this conundrum that underlies much of the difficulty in managing non‑point source pollution of shared resources on both a local (for example, a river) and an international (for example, the atmosphere) scale. Indeed, that one nation may gain considerably from non‑compliance, especially while others comply, underlies much of the hesitancy in reaching international agreements on pollution strategies. Consideration and comparison of how both deontological and utilitarian approaches to ethics address this issue may make for interesting debate. In addition, the role of international legislation compared to increasing public awareness in tackling the problem could arguably be seen as a directly parallel debate. That is, is a system of rules, or appealing to the general good, the most effective way forward? A fun, engaging and relevant programme, inspiring the viewer to consider the science within and how scientific process can be used to test ideas and develop theories, rather than just looking for a given answer to a known question. 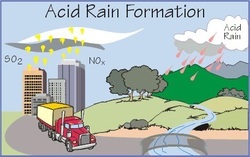 Learn the basics about Acid Rain. 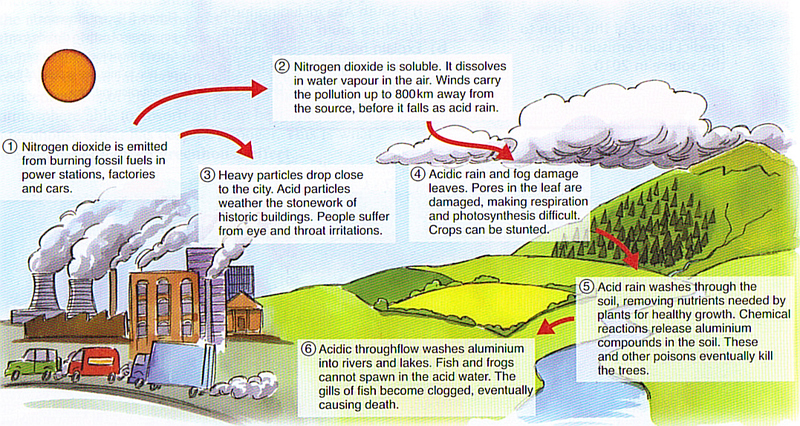 What causes acid rain? Learn the basics about reducing acid rain or its effects. How can we reducing acid rain and its effects? Rob Dunbar hunts for data on our climate from 12,000 years ago, finding clues inside ancient seabeds and corals. His work is vital in setting baselines for fixing our current climate -- and, scarily, in tracking the rise of deadly ocean acidification.